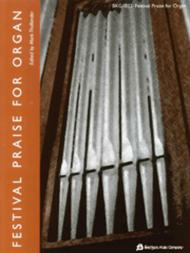 Festival Praise for Organ arranged by Mark Thallander. For Organ. Fred Bock Publications. 44 pages. Fred Bock Music Company #BGK1032. Published by Fred Bock Music Company (HL.8739854).ISBN 0634098837. 9x12 inches.6 worshipful anthems from top organ arrangers: Christ the Lord Is Risen Today (Diane Bish) • Hark! The Herald Angels Sing (Steve Sturz) • Joyful, Joyful We Adore Thee (Mark Thallander) • Now Thank We All Our God (Fred Bock) • Oh God Our Help in Ages Past (Frederick Swann) • Praise to the Lord, the Almighty (Craig Phillips).